While I was at the ADE institute in Austin, Texas I had the pleasure of the meeting the developer of an app called Toontastic. I have to admit that it was one of those apps that I had purchased a long time ago but had put in a folder on my iPad mainly because I work with mostly high school students during the school year. However, after seeing this Launchpad toys app in action at the Meet the Developers event at ADU I thought: “this is something that I simply MUST try immediately in the classroom.” Many apps can be flashy and fancy but when I look at an app I like to consider the question: how can this app support student learning? Toontastic allows young children to become creators and curators of their own unique learning experience. 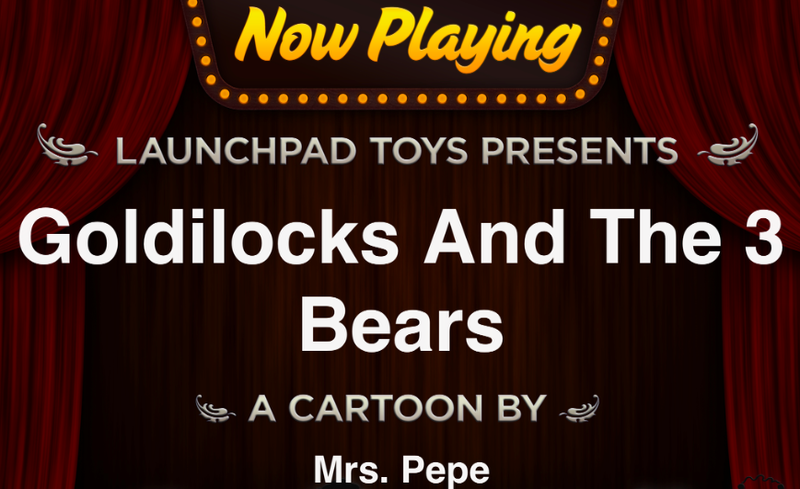 Today my class of combined second and third graders read the story Goldilocks and the Three Bears in an iBook. They listened attentively because I told them they were going to design their own cartoon about the story. Toontastic scaffolds student learning by dividing each cartoon into five parts: setup, conflict, challenge, climax, and resolution. Big shout out to the creators of the app for designing an intuitive way for the teacher to review parts of the story while still leaving the thinking to the students. The students use the five-stage storyboard to make their cartoon. The students’ click on the phase/section of the cartoon and the app provides a verbal reminder about the intent of the phase. Then the user is directed to a settings screen that is multi-versatile. You can import photos from your photo library, use the toy camera to take pictures of the class, or use some of the pre-loaded content from the Toontastic library. In my exercise I had the students pick out pictures of Goldilocks and the Three Bears from the web and we placed them in our photo library. Once you import a scene/setting the children can paint/draw on it. Since I was working with little ones I simply had them write their names in their favorite color. Next came the Toys phase of project builder in which you can import characters from the Toontastic library and or add your own figures. Then you can add animations and voice-over. My students were delighted to draw their own Papa Bear, Mama Bear, and Baby Bear to help practice understanding relationships and sizes. They giggle with glee and delight when they see the animation figures come to life on the screen. The final touch is the music phase where the app choices adjust based upon where the learner is in the story. For example the challenge phase offers musical choices like: loving, joyous, amazed, angry, depressed, and afraid. This is such a great non-conventional way to teach story mood and tone to young learners. My students were engaged to the point where they were rocking out of their chairs today! It took us about 25 minutes to complete the project from start to finish. What I realized about this app when using it today is that is what I like to call NC 17 friendly – meaning it can be used with learners of all ages. I am certainly going to use it in my high school science classes in the fall. Kudos to the good folks at Launchpad Toys for creating not just another app – but a thought-provoking technology that supports high levels of learning.